10 random things I'd like to have in my bookshelf! This sign, because it's a big effort to teach my beagle not to chew my books! This BB8 piggy bank to protect my savings! And obviusly some new and pretty bookmarks! I think I might need to add another bookshelf to actually storage books hehe. Do you also have random things in your bookshelf? 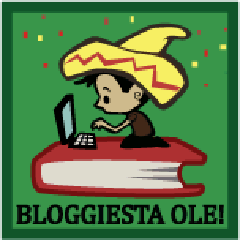 It's time for another Bloggiesta (Sept 15-18)! Hopefully it will give me a little push to post more, I've been very inactive lately. Update my profile and review requests pages. Check links from my sidebar. I'll keep thinking what else I need to do, but for now that's it. Sign up here!